Putnam Publishing Group, 9780399251597, 181pp. Read Danette Vigilante's blogs and other content on the Penguin Community. Ever since her brother's death, Dellie's life has been quiet and sad. Her mother cries all the time and Dellie lives with the horrible guilt that the accident that killed her brother may have been all her fault. But Dellie's world begins to change when new neighbors move into her housing project building. Suddenly men are fighting on the stoop and gunfire is sounding off in the night. In the middle of all that trouble is Corey, an abused five-year-old boy, who's often left home alone and hungry. Dellie strikes up a dangerous friendship with this little boy who reminds her so much of her brother. She wonders if she can do for Corey what she couldn't do for her brother-save him. 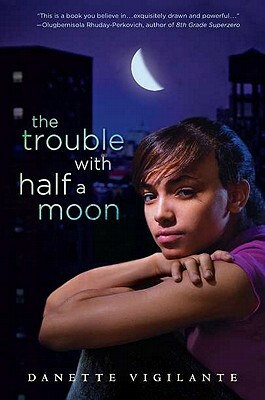 Starkly and affectingly written, "The Trouble with Half a Moon" is a sparkling and memorable debut. Danette Vigilante grew up in Red Hook Houses in Brooklyn and lives in Staten Island, New York. This is her first novel.